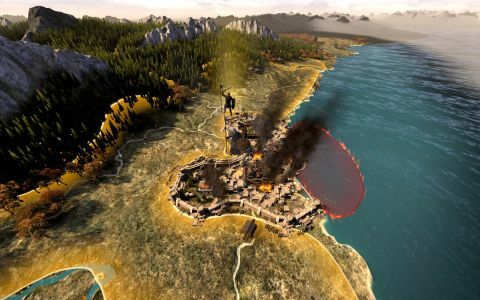 What is it Total War: Atilla expansion that edges the series into the Medieval period. Play it on Windows 7, Intel i5, 4GB RAM, 2GB Nvidia GTX 560 Ti or Radeon HD 5870. Multiplayer 2 player, versus or co-op. Age of Charlemagne expands Total War: Attila with a new campaign setting that takes it into the Medieval era. The first big Attila expansion—The Last Roman—laid the groundwork for this. That was set a hundred years after the fall of the Western Empire, and focused on the fascinating human story of Belisarius, the overly-loyal Roman general—probably the only man who could have revived it. It featured a really interesting mobile Roman faction, The Expedition, and four less interesting rejigs of barbarian factions that had survived to that era. Age of Charlemagne takes that structure and runs forward to the start of the medieval era, with a much more limited map that barely encompasses the Mediterranean. What Age of Charlemagne does offer that The Last Roman didn’t is a better range of factions. The worst of the factions are the Lombards—German invaders who’ve displaced the Romans from the north of Italy. They’ve got a buffed version of the tributary-state mechanics of the Sassanids from the main game, and little else to recommend them. Similarly, the The Emirate of Cordoba in Southern Spain, has a different (worse) take on the tributary state mechanism, fast research and reduced religious unrest. Then there’s the pagan Saxons from Westphalia, who get bonuses to raiding, focused on the Frankish kingdoms, but are a bit surrounded and doomed. All of these factions have standard dull units, with few advanced troops—this is doubly sad for Cordoba because the history of the Umayyad Caliphate is fascinating. The Avars are a so-so traditional hunnish horse army long settled in Pannonia, a peaceful region backed up against the edge of the shrunken map. Their task is to survive the short term onslaught of the Slavs, and build their power up to defeat the inevitable Frankish crusade—the Avars follow a lightning-worshipping pagan religion called Tengriism, which the Christian factions find intensely irritating. Over in the British Isles, Mercia is dominant in England, but starts surrounded by enemies—capturing the country is a pleasant challenge, even if they (again) have uninspired troops. The Kingdom of the Danes have a raiding playstyle familiar to older gamers who played the much-praised Viking Invasion expansion. Jutland, their home province, is on the edge of the map and surrounded by allies, so it’s fairly secure. Their faction quirk is twofold: a set of missions that screw the entire nation, army and economy, unless you get busy sacking England; and a bunch of bonuses that make them really good at sailing, sacking, looting and raiding. Your first ten turns or so are spent slowly sailing across the Baltic to England’s fair shores and declaring war on anyone you meet, before sacking every coastal town and eating all their crops. This tedious start is ameliorated by their awesome troops—I mean, who doesn’t like a unit types like Berserkers or called simply “Big Axes”? In the Northern corner of Spain, behind a line of razed provinces, sits the kingdom of Asturias—the easiest of the campaigns. Though their troops are merely yawnworthy, it’s easy to rebuild the burned provinces and suddenly have huge amounts of money and food rolling in, allowing you to pick off the isolated factions to your East and then take on the Emirate of Cordoba. The faction’s two quirks allow the razing and abandonment of their own settlements, in the face of an advancing enemy, and a hugely-increased ambush chance. Essentially, these guys do guerrilla warfare really well. Sometimes you just need to give up on a campaign, lick your wounds, and return later. The big faction though, is the Kingdom of Charlemagne. The huge kingdom of the Franks has been split between you and your brother Carloman after the death of your father, and along quite stupid lines, really. You’ve been given a huge, long thin strip of provinces wrapped around your brother’s territory, and you start with armies in exactly the wrong places to defend against the Saxons in Northern Germany and Gascons in Southern France. Should Carloman die before you (which you can help with) you can choose to claim his lands, and conquer his (horribly well-defended) capital. Once you’ve unified the Empire, you get to go and stamp on heretics all over Europe. A new mechanic has been introduced as well, called war weariness. Essentially, the longer you’re at war and the worse you do, the more the population gets pissy, eventually starting a rebellion to stop the war. This finally reintroduces a bit of zest into factional politics; sometimes you just need to give up on a campaign, lick your wounds, and return later. It’s still no Crusader Kings II, but then not every game needs to be that complex, and god knows Total War is feature-heavy anyway. Age of Charlemagne is another slow step forward for Total War: Rome II. Many of the rules are still obscure (what exactly is army integrity? ), the UI is still complex and unhelpful (Why does the game show you global food levels when only provincial food matters) and the troops for most factions are deadly dull. Despite that the game-breaking bugs are almost all gone, and most of these factions have interesting missions sets with early and mid-game challenges—especially Charlemagne himself. It’s a good tidbit to tide you over until the Orcs arrive in Total War: Warhammer next year.